May 10, 2018 -- MRI of the placenta is feasible in a 1-tesla open MRI scanner, and the technology can be valuable for surgical planning and safe maternal and fetal management in complex cases, according to Greek researchers. "Whilst the tendency in the research literature is to move toward higher-field MRI scanners, the judicious and resourceful use of a low-field scanner such as the one we had available ensures highly favorable results in terms of image quality and patient comfort," noted Dr. Papaioannou Georgia, director of pediatric radiology at Mitera Hospital in Athens. MRI (coronal survey image) of the placenta in a 31-week gestational age twin pregnancy shows kissing placentae. All images courtesy of Dr. Papaioannou Georgia, Panagiotis Tagalakis, and Dr. Christina Malamateniou. The median gestational age was 29 weeks and 5 days (range of 14 weeks and 2 days to 36 weeks and 6 days), and 20 women had a history of a previous cesarean section. Standard MRI protocol included single-shot spectral-attenuated inversion-recovery (SPAIR) and single-shot T1- and T2-weighted inversion-recovery sequences in coronal and sagittal planes, as well as additional T2-weighted sequences in the axial plane. All scans were performed after maternal hydration to achieve sufficient bladder filling for better tissue delineation, and protocols were optimized to ensure the highest possible signal-to-noise ratio (SNR) and finest spatial resolution. The researchers compared the imaging results with the operative findings. All scans were completed, although a claustrophobic patient had to be scanned twice, explained Georgia and her colleagues in an e-poster presented at ECR 2018 in Vienna. Better bladder filling after maternal hydration allows for further identification of areas of focal invasion of the uterine wall and possibly the bladder wall (arrows) from the anterior placenta, which was characterized increta and possibly percreta. On surgery, invasion of the bladder wall was not confirmed. Abnormal placenta was revealed in 21 cases: four cases of acreta, 11 cases of increta, and six cases of percreta. In one case, the presence of fibromas complicated sonographic appearances and was clarified by MRI. There was surgical confirmation of MRI findings in 10 of the 21 cases; in five cases that MRI had suggested wall and bladder penetration, surgical findings did not concur. 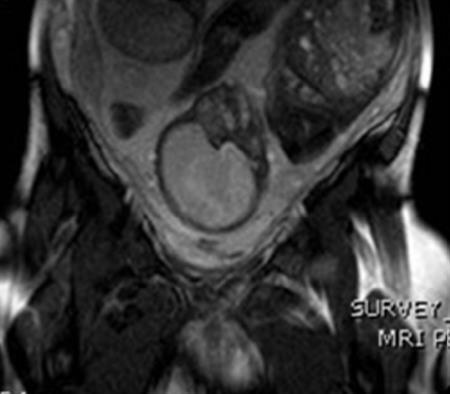 In two cases, MRI findings suggested subtle uterine rupture, which was confirmed intraoperatively. The placenta is named after the Greek word "plakuos," meaning "flat cake," and it is responsible for the nutritive, respiratory, and excretory functions of the fetus, but it only receives attention when an abnormality is detected in a regular fetal sonographic scan, the authors pointed out. "During the course of the pregnancy, both the placenta appearance and its location change; thus, imaging evaluation of the location with MRI is ideally delayed and performed during the end of the third trimester," they wrote. "Since the nationwide increase of cesarean sections, there has been an increase in the number of abnormally implanted placentae." Placenta previa refers to abnormal implantation of the placenta in the lower uterine segment, overlying or near the internal cervical os, they continued. It can be further subdivided according to its position relative to the internal cervical os in low-lying, marginal, complete previa, and central previa placenta. 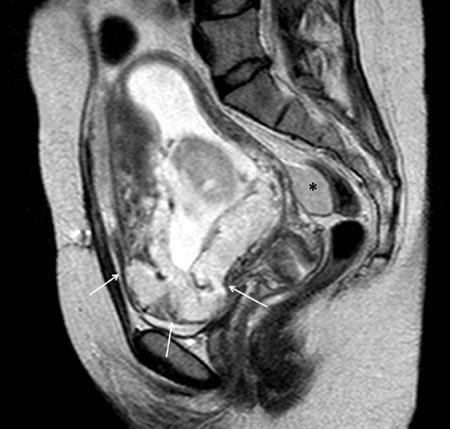 Sagittal single-shot T2-weighted image through the pelvis in a 16-week gestational age pregnant woman with acute onset of hypotension and vaginal bleeding. 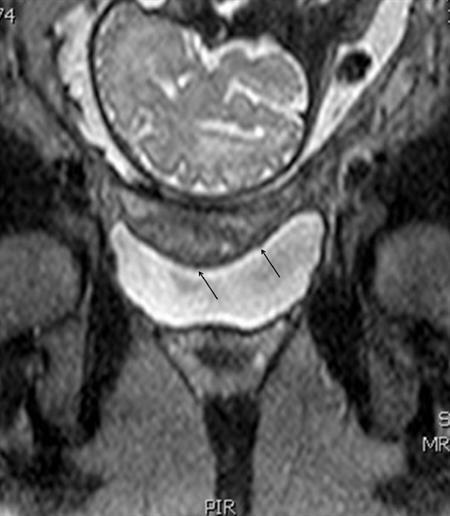 A placenta previa was identified with an abnormal contour of the inferior part of the uterus and loss of visualization of the normal uterine wall (arrows). Additionally, a bloody collection was identified in the rectouterine recess (*). Uterine rupture was confirmed intraoperatively. Previous uterine surgery predisposes to abnormal adherence or penetration of the chorionic villi to or into the uterine wall, the extent of which further subdivides the "abnormal" placenta to placenta accreta (superficial invasion of the basalis layer), placenta increta (deeper invasion of the myometrium), and placenta percreta (even deeper invasion of the serosa or adjacent pelvic organs), which may lead to thanatophoric hemorrhage at the time of the placental delivery, often necessitating emergent hysterectomy, the researchers stated. The co-authors of the ECR e-poster included Panagiotis Tagalakis, senior CT-MRI radiographer at the department of radiology in Mitera Hospital, and Dr. Christina Malamateniou, research lead at associate professor level in the department of family care and mental health at the University of Greenwich in London. Editor's note: View the authors' full range of clinical images and cases in the e-poster from ECR 2018.